Poor Jabba was let out of a car and dumped in a park. Now, the 15 year-old 26 pound cat needs a caring home. 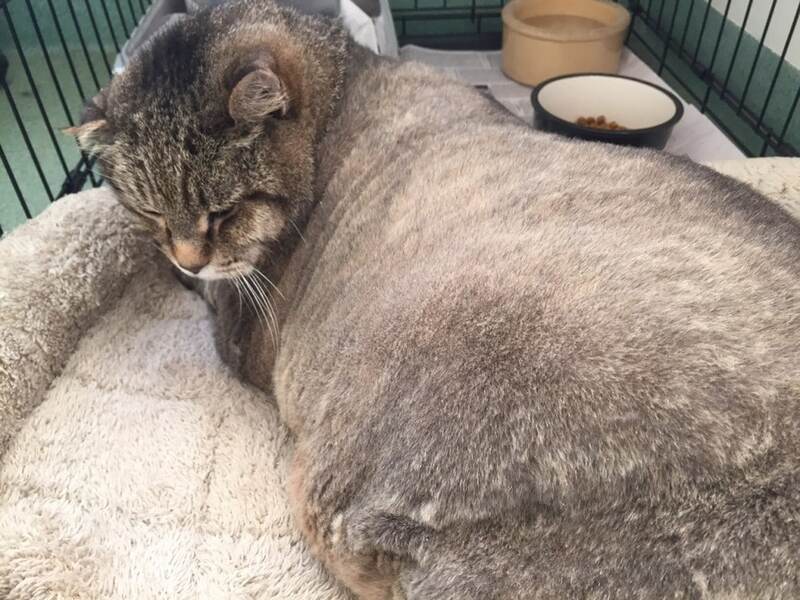 A Rhode Island shelter is caring for an obese senior cat recently let out of a car and dumped in a local park. “Terrible, absolutely terrible. 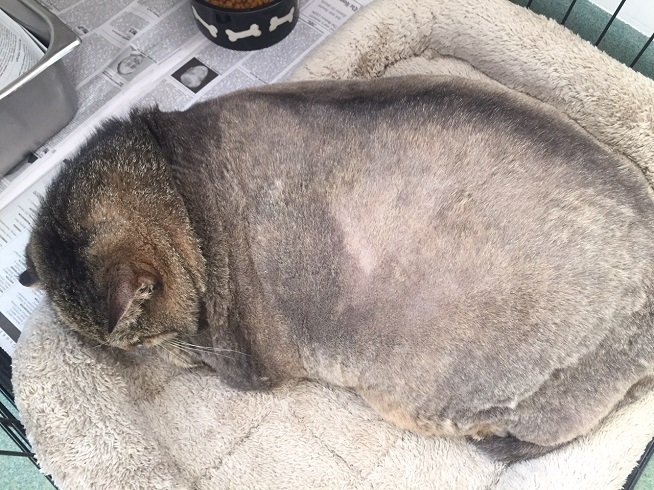 No animal should be treated like this,” Nancy Davey, head of cat adoption at the East Greenwich Animal Protection League, said when speaking with WPRO News about Jabba, as he is being called by shelter staff. Jabba is about 15 years old, weighs 26 pounds and was suffering the effects of neglect when found at the park. His fur – shaved for obvious reasons in the photos here – was matted and stuck with feces, and he could barely walk. Jabba was picked up from the park when someone called East Greenwich police on Friday, September 11 to report seeing a black Toyota drop the cat off at Scalloptown Park. Police responded to the scene and found Jabba on the grass. They placed him in a carrier and took him to North Kingstown Animal Hospital for care. He was released and transferred to the East Greenwich Animal Protection League a couple of days later. “I’ve never seen a cat quite this heavy,” said Davey. “It’s going to be extremely hard to adopt a senior cat that is severely overweight. Those interested in adopting Jabba and helping him to lose some weight and become more active again are asked to contact the East Greenwich Animal Protection League at [email protected] / 401-884-6333. I am so happy this year because the only man i love with my life who left me many years ago is back to me last week through the help of Papa Ork on the 2nd of July 2017 i came across a testimony which said Papa Ork help him to get his girlfriend back so i decided to contact Papa ORk through his email at:([email protected] com), to my greatest surprise yesterday my ex Husband called me and beg me to reconsider him into my life and today we are living happily as one family again through the help of Papa. if you want your ex back or you want your lover to love you and stay with you forever contact him now through his email above or visit orkstarspell. tk. Evil slime balls may Karma bestow upon you true punishment when you are old and vulnerable.